The Holiness of God is the basis on which God called us to be holy. "Be Holy because I am Holy" (1 Peter 1:16). The call to holiness is without exception. Regardless of our status or position, every Christian is called to be holy. 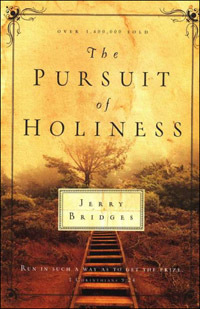 Bridges writes, "This call to a holy life is based on the fact that God Himself is holy. Because God is holy, He requires that we be holy." Of course, this is inferred in 1 Peter 1:15-16, "But just as he who called you is holy, so be holy in all you do; for it is written: 'Be holy, because I am holy.'" We must be aware of cultural holiness. Christians often develop culture holiness whereby they conform to the character and behavior pattern of those Christians around them. However, God has not called us to be like those we associate with; instead, God has called us to be like Him. Therefore, holiness is conforming to the character of God. Holiness is an attribute of God, which describes His majesty and the purity and moral perfection of His very being. Holiness is an essential part of the nature of God. In fact, His holiness is necessary for all His other attributes like wisdom and knowledge. God not only knows what is right but also He can only do what is right. That's the attribute of holiness. We are different. We do not always know what is right. And even when we do know what is right, we are reluctant to do the right thing. But this is not true of God, God never vacillates. He is holy. The apostle John said that God is light and in Him there is no darkness at all" (1 John 1:5). In other words, we can look at the holiness of God as the absolute absence of any evil in Him. John used light and darkness in a moral sense. He said God is absolutely free from any moral evil. In fact, God is Himself the essence of moral purity. In other words, all of God's thoughts and actions are absolutely consistent with His holy character. God always acts consistently with His holy character. However, this is not always the case with Christians. As we mature, we reach a certain degree of Christian character but we are not absolutely consistent with our Christian character. We can fall into sin and be dismayed with ourselves because our actions are not consistent with our character. This never happens to God. Because God is holy, all His actions are holy. This should be a great comfort to us. This means that God would not treat us unfairly. In many ways, to complain against God is to deny His holiness. We need to be very careful when we begin to complain. Because God is holy, He cannot tempt us to sin. When we find ourselves in difficult situations, we are at times tempted to blame God. However, James makes it very clear that God cannot be tempted by evil nor does he tempt anyone (James 1:13). Because God is holy, He hates sin. This may be a strong word but when it comes to sin, this strong word makes it very clear where God stand with sin. God hates sin, but He loves the sinner. As Bridges writes, "This is blessedly true, but too often we quickly rush over the first half of this statement to get to the second. We cannot escape the fact that God hates our sins. We may trifle with our sins or excuse them, but God hates them. God is not impartial when it comes to sin. He never overlooks sin. Because God hates sin, we need to cultivate the same attitude in our lives. As Bridges writes, "But it is nevertheless one that he holds us to. He cannot do less. While it is true that He accepts us solely through the merit of Christ, God's standard for our character, attitudes, affections and actions is, 'Be holy, because I am holy.' we must take this seriously if we are to grow in holiness."